Originally from the Atchafalaya Swamp border town of Henderson, Louisiana, Dunice Theriot’s music is once again some of the most requested music on south Louisiana radio stations. All of the music on this CD was recorded in the early 1970s and several became big jukebox hits all across south Louisiana. 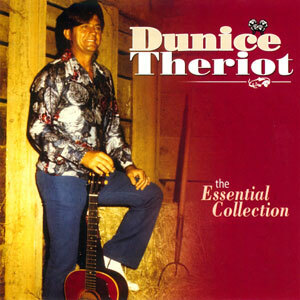 Thirty years later, it’s rarely a day that passes when you don’t hear Dunice Theriot on stations like Eunice, Louisiana’s Cajun radio powerhouse, KBON Radio 101.1 FM. To hear the late Cajun songster Dunice Theriot sing his side of the story, you’d never understand why love’s gotten such a good rap. His Essential Collection takes you on the grand tour through the good, the bad, and the ugly of the man-woman tangle. Luckily, misery loves company. That’s how Theriot’s sad, sad songs get pumped with genuine honky-tonk attitude. He’s got it all working for him: the lonely cry of steel guitar, a burst of fiddle, the chatter of roadhouse piano. And befriending the slow tempo only bolsters the case that this barroom bard is as blue as a boy can be. So this collection of early-70’s jukebox hits and often-requested songs plays like one of those nightly clinics for the heartbroken that Theriot would hold in such establishments as Knott’s Lounge in Arnaudville, the Western Lounge in Crowley, and the Old River Club at Butte LaRose. “Till the Day That I Die,” “Loneliness,” “Little By Little,” and even the palpable gumption shown in “Memories” celebrate with blue cheer, like Acadiana’s own answer to George Jones. Only an autobiographical “Living Cajun Style” momentarily diverts his attention from matters of the tattered heart, instead splitting attention between alligators and guitars. But then the storm clouds roll back in, as a back-to-back suite of odes to incarceration segues from his own “Lonesome Prison” and “Operator Dial Home” to Johnny Cash’s “Folsom Prison Blues,” ending things on an appropriate downer. But you wouldn’t want it any different from one of south Louisiana’s favorite brokenhearted warriors with keen insight into the brutal battle called love.